This easy to make, darling bobby-pin accessory works for children and adults alike. Crochet it for use in weddings, for Easter, or any time you need a tiny flower to to add interest to your hair. If you’ve never worked with crochet thread before this is a great first project! Originally I came up with this design to sell at craft fairs and farmers markets. People are always looking for a deal, and with how quickly these work up, you can easily make a large variety in all kinds of colors. Keep scrolling down to get to the flower pattern. Gauge is unimportant. 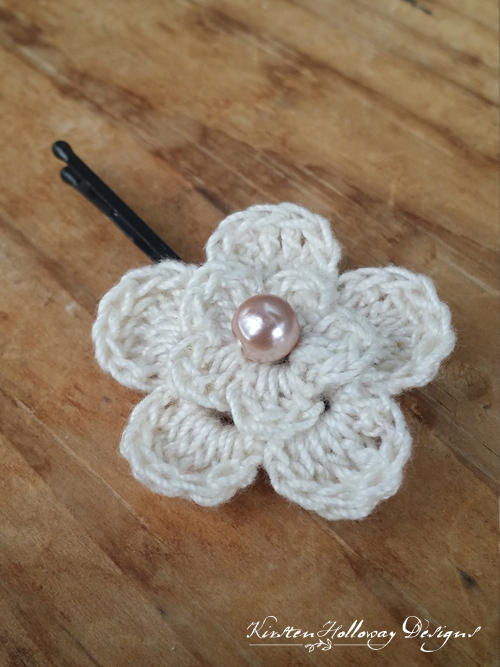 This crochet flower looks cute at almost any size! Finished flower measures approximately 1.5″ across. Round 1: ch 6, join to first ch with sl st forming ring. Note: You may use magic circle for this step instead if you prefer. Fasten off and weave in center end. Using 12″ long tail, sew a bead in the center of the flower, and use the remaining length to sew the flower to the bobby-pin. This post contains affiliate links. When you purchase something using these links a small amount of the sales price goes to me. However, you do not pay any extra for the item you purchase. How cool is that?! I was just needing a pretty little flower for a teddy bear, thank you! I love this. Perfect for a little girl’s hair in an upcoming wedding. Thanks! They all sound like wonderful treasures! I’m sure your granddaughter will be very appreciative of the gloves, bag, and garter, just as her mother is, for your sweet gifts at her wedding.